Let’s just get this humble-brag out of the way now: I’m REALLY good at making sandwiches. It’s mostly just about piling delicious things onto fresh bread. It’s not really rocket surgery. Making a sandwich for someone is dang important. A good sandwich can’t be faked. Avocado must be ripe. Bacon must be crisp. Produce must be fresh and cheese must be perfectly melty. It’s a science… but it’s not a science at all. It’s just a sandwich, but it’s important. Can we just talk about sandwiches? K. Thanks. I call this sandwich The Ultimate Club because it’s totally top-shelf. 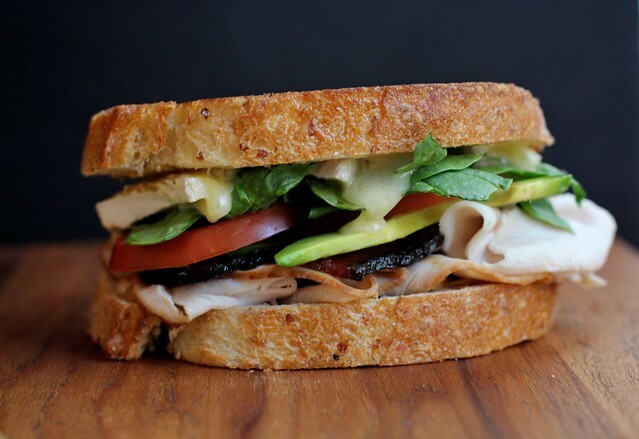 We’ve got crisp Black Forest Bacon, whole grain mustard, ripe tomatoes, baby spinach, roasted turkey, and ripe avocado. Wait.. did I mention melty Brie Cheese!? Yea… it’s serious. Mustard is smeared. 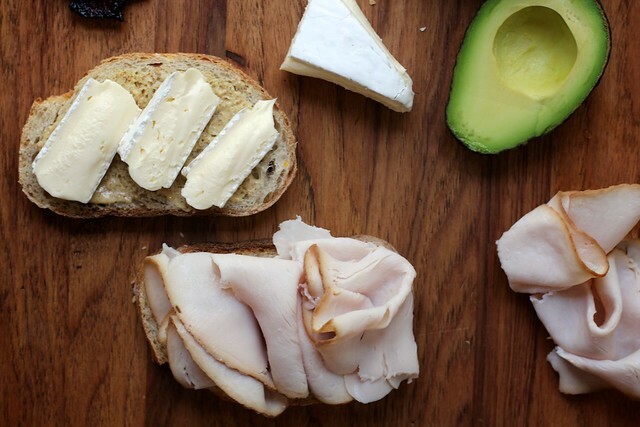 Brie and turkey are piled generously. Bacon should probably be on every sandwich ever, including this Peanut Butter Pickle Sandwich. Yea… I went there. Only two things could make this sandwich better: avocado and grilling. We’re going to make both happen. Duh! By now you may know that I have a serious obsession with outrageous sandwiches. I’ve made Spinach and Artichoke Grilled Cheese, , French Onion Soup Sandwiches, and Pepper Jack Spicy Grilled Cheese. Seriously delicious. like whoa. This Ultimate Club is easily one of my new favorites. It has everything a good lunch sandwich should have and it feels like a total treat! 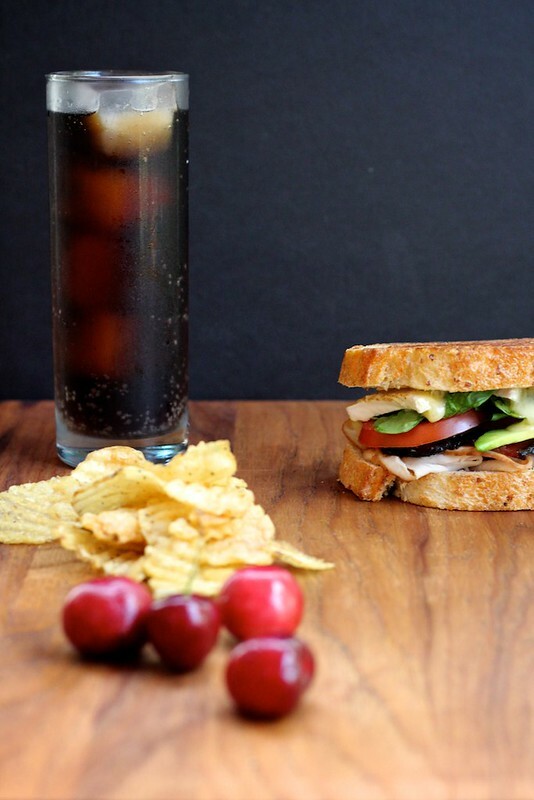 Served with fresh cherries, potato chips, and a Dr. Pepper… come on. Get in my life, for real. You know how to make a killer sandwich. You don’t need any help from me. But… while we’re here, let’s just spell this out. Spread two slices of bread with whole grain mustard. Top one of the bread slices with a bit of Brie cheese (rind and all). Top the Brie bread with a bit of fresh baby spinach leaves and a few tomato slices. On the other slice of mustard covered bread, add roasted turkey slices. 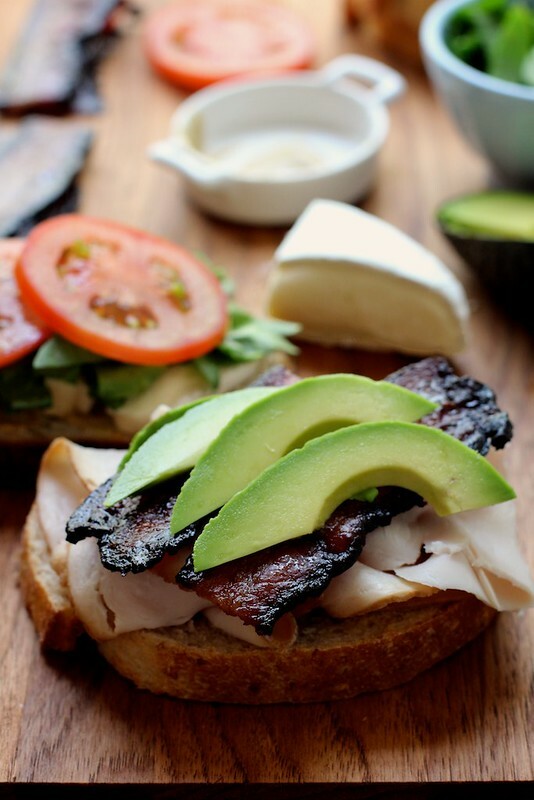 Top with cooked bacon and sliced avocados. Smash the two slices of bread together. In a medium saute pan, melt a bit of butter over medium heat. Grill sandwich until golden on each side. Serve warm. It’s yummy. These look absolutely scrumptious….anything with avocados…or bread….or bacon (I feel like homer simpson when he thinks about doughnuts haha) count me in! This looks AMAZING. 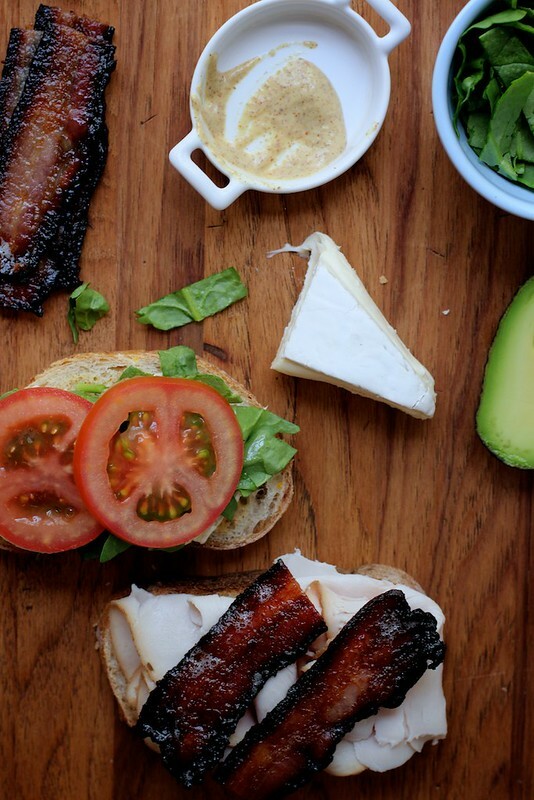 I’m a big fan of sandwiches in general, but go ahead and sign me up for anything involving both bacon and avacado. So when can we expect a sandwich cookbook? :) Love this recipe. I never make good sandwich’s, lol. Thanks! We serve a Club at our restaurant – classic 3 toast, white or rye, mayo, roasted chicken, bacon…the tomatoes are cold but previously baked. Make a balsamic simple syrup = equal balsamic to sugar, bring to a quick boil and done – bottle and keeps in the fridge for a couple of months. Slice the tomatoes place on a parchment covered cookie tray. Salt and pepper, drizzle(can’t believe I just used that word) with cooled balsamic syrup. Bake 325-350 approx 12 minutes just until the skin slightly wrinkles or pushes in to touch. Cool on tray in fridge. The tomates stay firm, can easily be stacked between parchment paper in a container for a week. These are addictive, you will find multiple uses for them – they make a grill cheese sing and yes avocadoes love them! Dear Joy: you cheer me up when I’m feeling blue. Thank you very much. Oh yes, Brie!! I love this sandwich. It truly is the ultimate sandwich! I’m all over this! 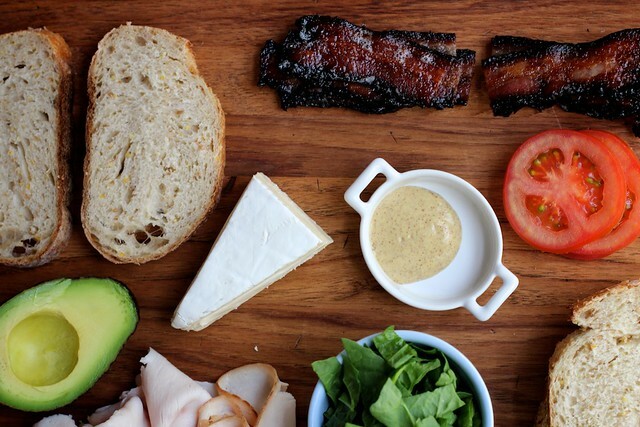 Especially the bacon and Brie part…..
LOVE a great club sandwich. My husband is obsessed with them. He always orders them for brunch. Your bacon looks to die for. I never seem to cook bacon well. Its either burnt of not crispy enough. Those avocado slices look so vibrant and sharply in focus that I could reach through my screen and grab them! Beautiful, Joy! You do make pretty amazing looking sandwiches. This is another winner! Eurgh I drooled too much. This looks like the most perfect sandwich. I’m 13 weeks pregnant and brie is off the menu…I’ve never wanted brie more. I’m bookmarking this for when the baby comes and it’s party time with a wheel of brie! I think there has to be a order you place things in sandwich so they all stay nice and crisp. Always lettuce and tomato in the middle with the protective layer of meat or cheese to keep in place. The the crispy bacon always on the top because who doesn’t love crispy bacon?